By the standards of behemoth mega-caps Procter & Gamble’s (NYSE: PG) share price has been on a bit of a roller coaster ride in the last couple of years. The shares hit an all time peak right around Christmas 2014 at over $90 per share; then they lost a quarter of their value over the following nine-months to September 2015; and now they have rallied back up to over $80 per-share in the last few months. Now a lot of that is undoubtedly down to what’s been happening in the wider market, but there has also been plenty of talk about the company’s performance post the financial crisis. Organic growth has been a bit of a problem for the company since 2009. Actually registering any growth has been an issue since earnings per share have essentially been flat over the past few years. Lower margin brands are being divested; Warren Buffett’s Berkshire Hathaway swapped out their stake for the company’s Duracell subsidiary; and the strong dollar has hurt them overseas. When you consider that the company generates something like 60% of its sales abroad then it’s not surprising that the latter has had a particularly acute effect in the past two years. In 2015 for example that currency hit was enough to turn 1% organic revenue growth into a 5% drop. Core earnings per share in the same year took a massive 13-point hit on foreign exchange effects. The current case of Procter & Gamble offers a great lesson in how to look at something that affects all stocks at some point: low growth. Instinctively there are going to be those who decide to sell-up and move away from the stock at the first sign of stagnant revenue and profit, but for companies like P&G these kinds of periods are going to be inevitable from time to time. The most important thing for me is whether core profitability is intact. The great thing about consumer giants like Procter & Gamble, Unilever and Reckitt Benckiser is that they are enormous cash cows, and what that gives them is huge flexibility to ride these kinds of periods out. 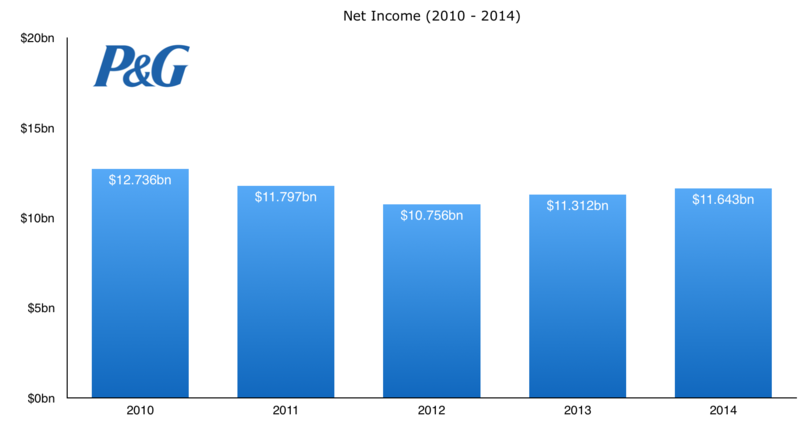 Let’s take the headline net income figures as a good example. Between 2010 and 2014 Procter & Gamble’s net profit (excluding extraordinary items) fell, going from $12.7 billion to $11.6 billion. Let’s just ignore the effect of currency fluctuations for the time being. At a compounded rate that works out as a roughly 2% decline each year in the bottom line earnings. Now, one of the most obvious things that highly cash generative companies can do to mitigate this is to periodically buy back their own stock. A quick glance at the data sheet tells me the company manage to retire 6% of the float over that four year time frame. This is why the company’s per-share earnings actually ended up growing over that period, from $3.47 to $4.05. Exxon Mobil is a great example of getting this right. Up until now oil has been a stodgy old business – it requires a lot of investment but it’s a very hard industry to disrupt. The upshot is that the wide-moat firms such as Exxon and Shell could return massive amounts of cash to shareholders without degrading their earnings power. IBM, on the other hand, is a great example of when it might go wrong. You’d be hard pressed to argue that all that cash spent buying back shares couldn’t have been put to better use actually investing in the future of the business. Its earnings power is under threat of degradation due to the nature of the tech industry being so disruptive. In other words lucrative cash generating businesses can get obsolete quickly. Now if you had to pick between IBM or Procter & Gamble to hold for a minimum of fifty years without selling then for me it’s a hands down no contest – Procter & Gamble would win every time. The earnings quality is not just high, but it’s extremely stable because the company’s products are exceptionally sticky by nature and not prone to huge disruption. Tide, for instance, was one of the top three brands that consumers would be reluctant to give up during The Great Recession. It’s worth repeating but the single most important point to consider is whether the core profitability of the underlying business remains in place. With a firm like Procter & Gamble, which has power brands spread over multiple product categories such as Gillette, Tide, Pampers and Head & Shoulders it’s going to take a heck of a lot to degrade that associated earnings power. Looking more specifically at the numbers for the company and you can see just how cash generative they are: over 70% of operating cash flow ultimately ends up as a free cash flow. This is ultimately why long-term holders of exceptionally high quality companies should ride out periods of low growth. Stagnant growth over a five year period is probably going to look like a blip on a thirty or so year holding period in any case. In the meantime you will get treated to the pleasure of a pretty nice dividend check every three months that comes to somewhere around the 3.5% mark on an annual basis. That is all courtesy of simply owning a business that, despite slow growth, still prints cash. After all, the brands that this company control make their way into nearly all the homes across the developed world. Reinvest that dividend cash flow into more stock and bump up your exposure in times when the valuation multiple comes down and you’re all set – let the compounding take care of itself. Even zero growth doesn’t look all that bad once you add 3.5% worth of dividends and the buybacks which are running at about 1.5% of the float. All that is possible because the earnings and cash flow are so high quality. For the fiscal year 2015 the cumulative amount spent on those dividends and buybacks amounted to 83% of free cash flow. Some don’t like that high pay-out ratio, but because large parts of the business run on auto-pilot the company is able to return huge sums of cash to shareholders without harming the future earnings power. Someone who purchased the stock at the start of the century would have paid around $55 for a single share (this is literally just before the dot-com crash). Over that time frame $26.30 per share gets returned through cash dividends. 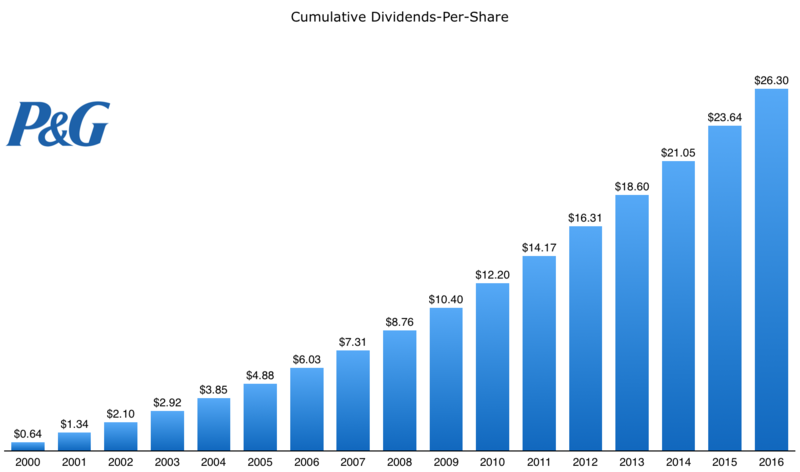 So half of your capital has already been returned in the form of dividend payments over the past sixteen years, a number which itself is hugely understated because the share price was at all time high due to the dot-com bubble. Buying the stock just a few months later, post-crash, would have meant that nearly 100% of your investment had already been returned through cash dividends. So even a “no growth” stock can deliver sustainable, modest returns as long as the earnings power remains intact and is high quality. A company like Procter & Gamble is in that “hold forever” camp, and the stock will trade at a premium more often than not. That’s the reason why looking at price-to-earnings ratios can sometimes be quite deceptive; high quality companies can deliver fantastic returns even though they constantly appear to be overvalued. That deceptive value effect is amplified when you add in the recent currency effects on the accounting numbers. A 2% drop in core earnings per share turns into an 11% increase once you turn the dollar figures into their local currency equivalents. Add that to long-term earnings quality and it certainly helps to put low-growth fears into context.